Lifestyle socks from the sports specialists, designed to make feet feel great, but without being seen doing just that! New balance Active Elements No Show Socks work almost invisibly to keep feet fresh, with breathable mesh panel uppers and the proprietary NB Dry moisture-wicking and NB Fresh odour-resistant tech. 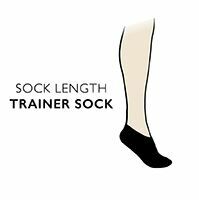 In triple packs, with both men’s and ladies’ fit, these light, fine gauge non-cushioned socks have Stability Fit arch support bands and reinforced, Y-pocket shaped heels to keep socks in place comfortably. NB Dry Moisture management helps keep feet cool and dry; Mesh panels increase beathability; Reinforced Y-heel pocket; Stability fit arch support for a snug fit.